to participate in the program for a year. We are finally publishing this source book of our valuable achievements of the year. During the year, the artists in residence had opportunities to take part in various programs, such as the Research Program that provided lectures on the history of Incheon and field trips to local sites with pertinent issues, the Platform Salon that was the site of artistic discussions, and the Criticism Program that helped artists connect with specific art critics based on their creative activities to deepen their investigations. The Incheon Art Platform strived to vitalize creative energies of the artists through providing various opportunities to present their work, including the preview exhibition IAP Short Stories, Open Studio and the End of The Year Report Platform Artists, the ‘local research project,’ Tell Us Your Stories, and other public art support programs. The year of 2017 became the turning point in the operation of the Incheon Art Platform. Following the cultural policy of the city of Incheon, the Platform initiated the open workspace program and created an art market that provided extended opportunities for its citizens to enjoy art. Its aim was to connect artists to the public through various projects that vitalize outdoor spaces, increase the numbers of outdoor concerts and art installations, as well as set up an information center. These projects became the driving force for artists to come out of their studios and reach out to the public. opportunities for resident artists to visit international art events such as Documenta in Kassel and the Skulptur Projekte Münster in Germany. In 2018, the Incheon Art Platform will do our best so that all the resident artists can benefit from the international residency exchange program, as well as provide constant support for our resident artists. For example, we plan to hold a solo exhibition of AHN Sanghoon’s work, who was selected as This Year’s IAP Resident Artist, 2017. The Incheon Art Platform is devoted to leading the trend in contemporary art, and committed to developing and operating a Korean (Incheon) residency program that is also globally competent. We are also putting our upmost efforts to producing various platforms that can meet the needs of the public and the artists. 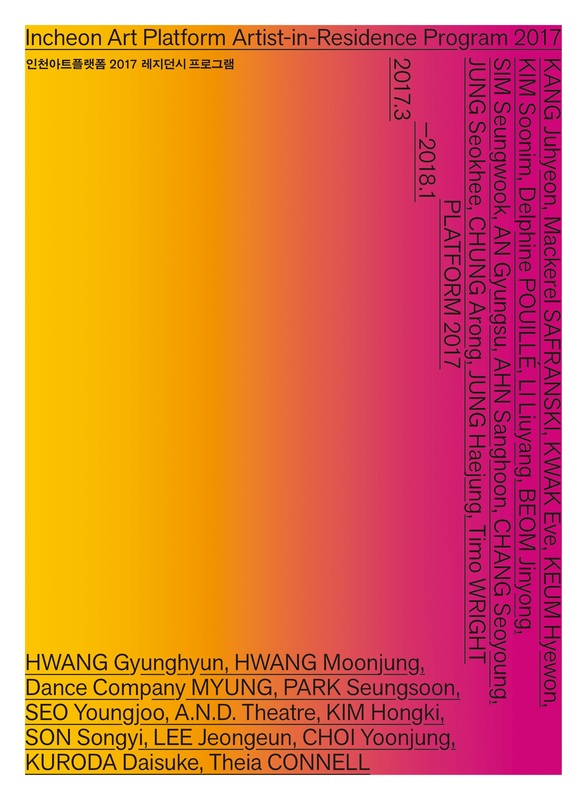 Last year, in 2017, the Incheon Art Platform went through all of these experimental processes in order to open up the possibility to become a ‘platform for creating art’. of the Incheon Art Platform despite the difficult surroundings for creating art. There is a saying, “those who meet must part, those who part will meet again (會者定離 去者必返).” We will always cheer for you to take a leap forward to the international stage, and hope to see each other again at the Platform.